If you want to succeed, you can’t hide forever — you have to go out and start networking. When you meet people, get them to talk about themselves first. Get a business card now. Don’t ask for anything until you’ve established a relationship. The strongest way to establish that relationship is – offer something! Use the PHONE! It’s unique. When you go on tour, use it as an opportunity to shore up your core fan base as well as gaining new fans. You will not make it in music without mastering the power of live networking. That’s the problem with all of the digital tools available to us: Way too many artists believe they can hide behind a screen and launch the careers of their dreams without ever talking to other humans face to face. It is crucial to connect the dots of your digital world to the real world. Even if you only want to be a studio musician and never tour, you still need to be able to meet people and find out about potential work. It can be hard to break out of your comfort zone, and I have met so many artists who struggle with anxiety and a sense that networking means “selling” but the most successful people go out and meet other people who can help them. Here are some real-life Networking 101 tips that I learned from Larry Sharpe who is such a master at networking that people literally line up to talk to him at events. I know this because when I met him I stood in line to do so! Networking: 3 Reasons Musicians Need to Network! Gain a sphere of influence, and a source for referrals (more fans) as everyone is connected online. Become a resource for your fans and for yourself. Unless you are a complete hermit, you are probably in social situations quite often, parties, work events, picking your kids up at school, the grocery store, anywhere where it’s not you and your immediate family in the house… These can all become networking opportunities to connect with potential fans. How do you do that? Simple: The more they talk, the more memorable you are. First ask a question about THEM: “What brought you here today? How did you meet the band that you opened for tonight?” Get them talking. You will be amazed at how fast they will and this takes any pressure off of you to talk! Never start out by saying say: “Hi, I’m David.” That makes it all about you. Instead, you want to say something like, “So, what do you do?” Or, “Are you having a good time?” Or, “What brings you here today?” or “Aren’t these mini quiches amazing?” Now, it’s all about them. OK, you are talking…WHAT NEXT? After getting people to talk about themselves a little bit see how you can help them. Do they want information? Tips? Music lessons for their kid? the best bakery in town for red velvet cupcakes? A great place to buy an outfit? A car mechanic? You know stuff – you can help! If you do not have any other specific goal that day, getting a social media connection is a great goal – Facebook, Twitter, Instagram or Linkedin are all great choices! This means that whenever you are in any social situation, you should be gathering as much information as possible about each person: interesting tidbits about them, what they like, who they know, where they go, etc. This way you can help them! If you don’t have one for your music GET A BUSINESS CARD NOW! You have no excuse – they are less than $17. For basic cards go here. This site has thousands of designs to choose from and they even have an “Art & Entertainment section to choose designs from. I suggest you choose one that shows off your photo and or logo and you add your pitch from Week 2 as well as your brand colors. Make sure your business card has all of your contact information on it, including your website. If these don’t float your boat try these: a bit more expensive but more fancy and cool. Put one sentence about your music, and the instrument you play on your card. A card with just a name and an address is totally unmemorable! Put a photo of yourself or your band logo on the card to add even more branding and recognition. Make sure you list your email, website, and links. Don’t worry about giving out your card. Focus on getting their cards. After you get home and it’s time to follow up, never send your marketing pitch or talk about your business in the initial email or social media post. If you are on Facebook or Linkedin you might discover that you have a few other friends in common – this is a great icebreaker! Tag those friends and say – wow! I didn’t know you knew each other! Then OFFER something – a link to an article, an intro to another person who can be helpful a follow up on whatever you spoke about – anything to be helpful. Then close the email with your name and sig file that has your links to your site, your Noisetrade widget with free tracks, Facebook Page, Twitter handle, etc. The first follow-up is always friendly and positive and not business-oriented! Now you have one more possible fan in your online world who is connected to your offline world! When networking, don’t think about your business or the music industry. If you are trying to grow your contacts (and you should always be trying to do this), it’s helpful to go to the places that are the exact opposite of your industry. So, as a musician, you would go and network with a bunch of other musicians if you were looking for more people to play with or to tap into a community of musicians. However, this is probably not going to make you money or more fans. TIP: If you go to, say, a bridal convention, and you meet a whole bunch of people who are planning weddings, and you introduce yourself as a musician, you might get some really good gigs. Stop hiding behind a computer! Something like, “Hey, Larry. Laura asked me to give you a call. This is Ariel.” Use only your first name. Never say, “Hi, my name is Ariel,” because then people will think of you as a stranger (you would never call your mom and say: “Hi, my name is Ariel.” It’s too formal). So, just say: “I’m Ariel,” or “This is Ariel,” and then carry on with your conversation. After they have talked about themselves) and you are ready to make your pitch, talk about what other people say about you, instead of pitching yourself. Why? Because people always believe what other people say about you more than they believe you saying it about yourself! So, you could say something like: “People say my music sounds _______________________touch of ___________.” Or, “My voice gets compared to ___________. This will register very well. Okay, you are ready to go to a party, a wedding, an event for a friend… whatever. Focus on what it is you would like today, this week, this month, to move your musical career forward. If you need to, write down the one or two things you would like. The default thing you can always ask for is a business card so you can grow your email list. Keep that thing in mind when you walk out the door. Really want it? Before you walk in the room, touch your head and repeat to yourself the exact thing/things that you want. Now follow all of the tips above. The most important thing you can do on tour is build a base of loyal fans. If you’re just starting out, it’s a big leap of faith for someone to spend money and give up their time to watch you perform, especially when people have so many other entertainment options. Before you go on the road, go through all your followers and email subscribers and organize them by market, then reach out and say hi. Offer them something; if the crowds are small enough, maybe they want to join you for a beer before the show and bring a friend. You can check with the club to see if they’ll allow people to watch you soundcheck, or hang out after the show. Some bands really go above and beyond with fan service. A while back, a rock band called MuteMath did a pre-tour of their new album, giving fans in each city the chance to hear the new record with a member of the band, and then ask questions and hang out. If a band you loved did that, you best believe you’d come to see every show they played and buy everything they put out. When you go on tour, make sure to designate someone in the band as the accountant. You need to have a clear budget for the tour, and include lodging and food and gas expenses, as well as keeping some in reserve for flat tires or emergencies. Remember that you’ll have to pay taxes on every show you play in each city; some clubs will deduct that off the top but others won’t so be aware of that. In general, before you go on tour, it’s a good time to get your financial house in order and work with an accountant if needed. They might advise you to set up a corporate account for the band or tell you which expenses you can deduct from your taxes. In general, a few hours of time with a professional will cost much less than IRS fees. Some bands build tours around appearances at festivals like SXSW, and it’s worth talking about whether fests like SXSW are worth it for smaller bands. After a few years of being dominated by massive headliners and huge brand sponsorships, SXSW has started to rightsize, and the last few years have been much more mellow. If you get an offer to play SXSW, it’s worth taking, but just keep expectations in check. Even if pop stars aren’t playing in vending machines opposite your set, there are still hundreds of other bands, including some with sizeable buzz, as your competition. 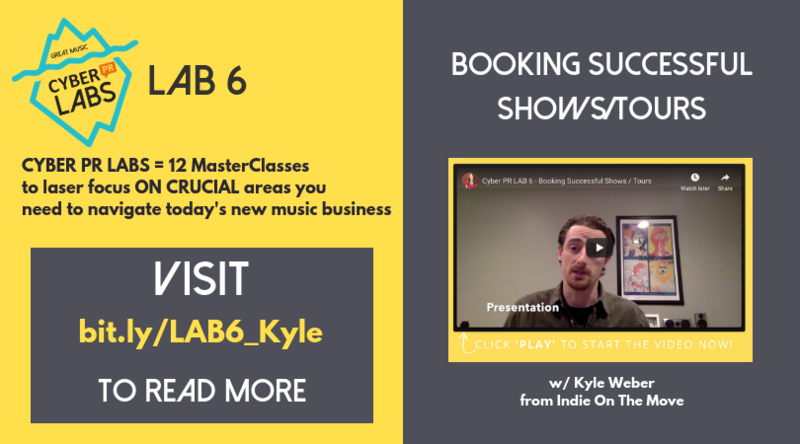 KyleWeber Co-Founder of Indie On The Move IOTM and I are teaching “Booking Successful Shows/Tours,”, a 3 part Masterclass on how to effectively book better local gigs or tours.